It was a problem of Robert Jordan’s own making, and it smacked him upside the head every time he ventured into his garage. 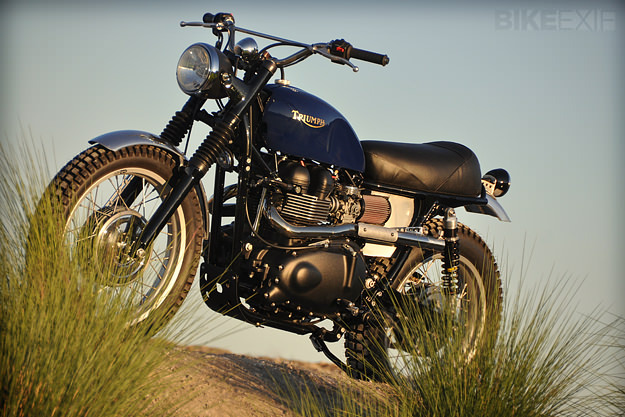 There sat a perfectly restored 1960s Triumph 650 desert sled, looking like it just came out of Steve McQueen’s garage. Right next to it, his modern ride, a 2007 Triumph Scrambler—and the new bike was suffering greatly by comparison, a little too big, a little too bulbous. 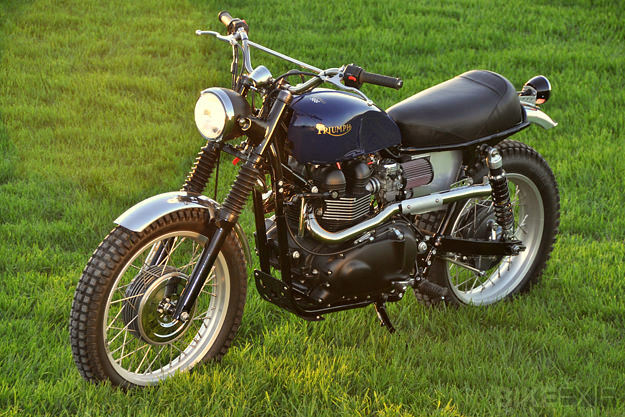 Not surprising, given that the Scrambler is basically a Bonneville street bike with high pipes and wide handlebars. What to do? 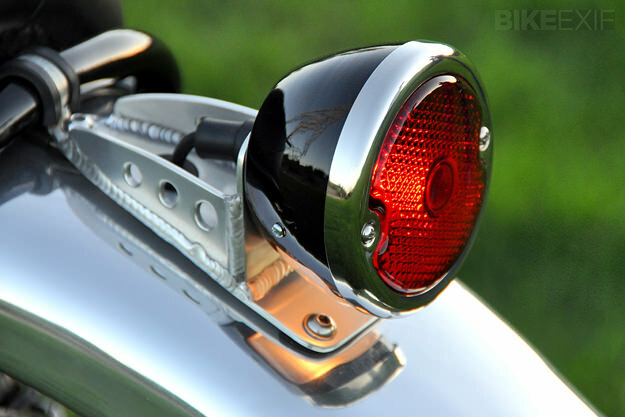 To Jordan’s eyes, current Scrambler conversion kits just don’t have enough sled in them. He wanted a finished product that at first glance might be mistaken for something that bounded across the Mojave Desert in 1966, throttle locked, flat-out for the smoke bomb, puckerbushes and open mine shafts be damned. So he called Richard Pollock at Mule Motorcycles. Best known for his super-clean street-trackers, Pollock has lately been doing a lot of work with Hinckley twins. Besides, he’s a keen student of moto-history and always up for a challenging build. First order of business was getting the Triumph’s top side shaped up. 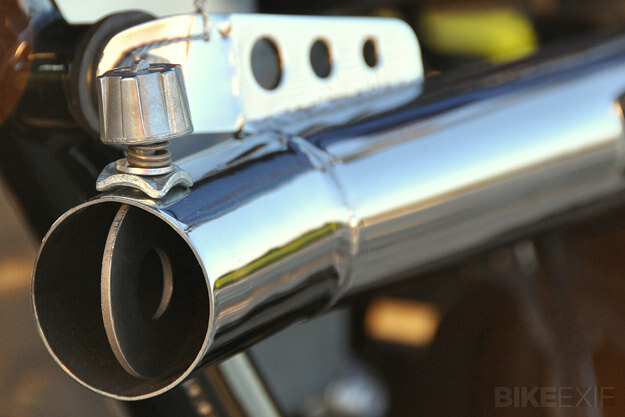 That involved alloy fenders, a replica of a Bates competition saddle sitting atop a truncated subframe, braced CZ handlebars, and a new steel gas tank, much thinner and cripser than the stocker, fabricated by Racetec in Oxnard, California. A bigger dose of retro came with the brakes. Out went the Scrambler’s hydraulic discs, replaced by a 1968 BMW drum up front and a Yamaha XS650 unit out back. Important to the desert sled style are short, engine-hugging high pipes. Longtime Mule collaborator Mark McDade fabbed these out of stainless-steel to which Pollock grafted heat shields to protect tender inner thighs. Snuff-or-Nots, a popular 1960s accessory, cut down on noise when the washers inside the pipes are flipped to the closed position. What looks like an oversized alloy oil tank under the seat actually isn’t. 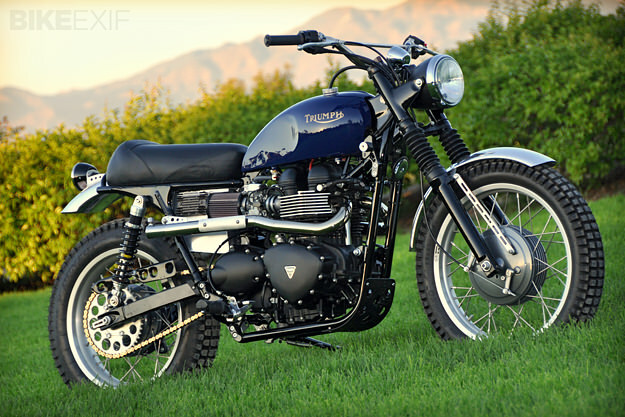 The Triumph motor is a wet-sump design and doesn’t need an external oil supply, but the “tank” serves as a good place to hide the Scrambler’s relocated electrics. It’s even got cut-outs to clear the K&N air filters—all very authentic-looking. How happy is Jordan with the Mule-ized Triumph? 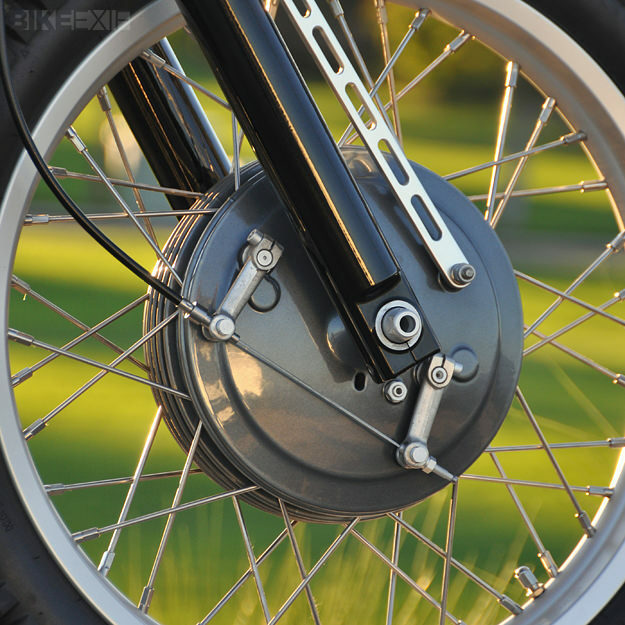 The online automotive marketing consultant is thinking of branching out to two wheels. He’s named the bike “Catalina Scrambler” in honor of the famous 1950s dirt race held on Santa Catalina Island off the So-Cal coast, and is talking to Pollock about producing a limited run of replicas. Neo-sled, anyone?